I had an article sent to me recently by a friend in the U.K. about taking pictures of bubbles in winter! 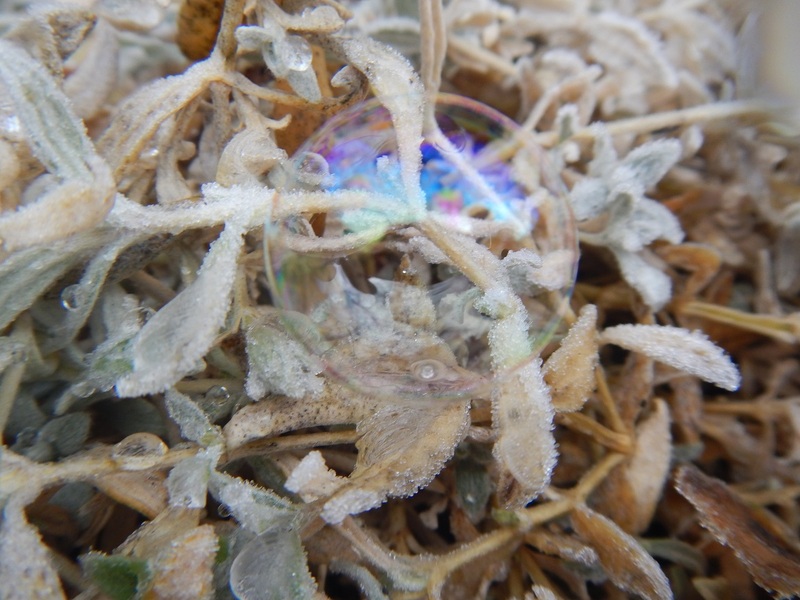 I loved the magical pictures of the bubbles intermingled with frosted plants and decided that this past Sunday, I would try my luck. As synchronicity would have it, I was asked to look after my six year old nephew for a sleep over on Saturday as well, so this gave me even more incentive to connect with my inner child. Sunday morning, we bundled up and went out in my backyard that has loads of different plants. We set up the yoga mat to lay on, blow the bubbles and then take the pictures. The squeals of delight from my nephew were absolutely priceless. The pictures that we both captured held a certain kind of magic. I have to admit that I am grateful for digital cameras and the over 100 pictures we took to get these gems! I received a wonderful compliment from someone who saw this picture on the right and thought I had photo shopped it because the needles from the carpet juniper are stuck into the bubble. I can assure you that none of these photos have been photo shopped in any way, shape or form. The trick is to use glycerin when making your solution. Make this a couple days ahead of time. We tried the really big bubble maker but the bubbles burst too quickly. The smaller bubble maker made bubbles that kept their shape a very long time. My nephew also enjoyed popping the bubbles after we were done taking pictures. They did not pop the way they would have in warmer temperatures but instead looked like they melted. We spent an entire hour outside and the only thing that stopped us was the fact that my nephew got hungry. This was an incredible experiment for me and one that I plan to do again, even if my nephew is not here! I am currently taking a creative journaling class and the key word that came up for me last week was the importance of play and its link to creativity. May you gift yourself the time to connect with your inner child and see the wonder and magic that is all around us if we just slow down and look.